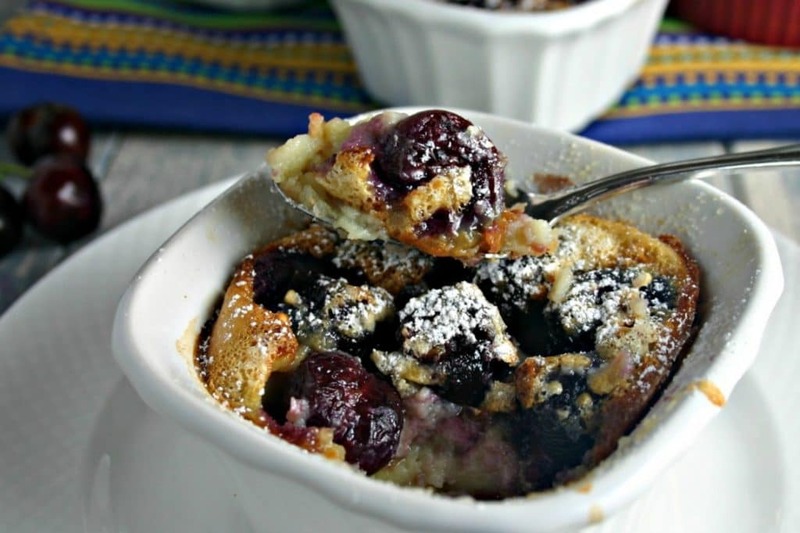 Cherry Clafoutis is simply a baked custard with an elegant name. 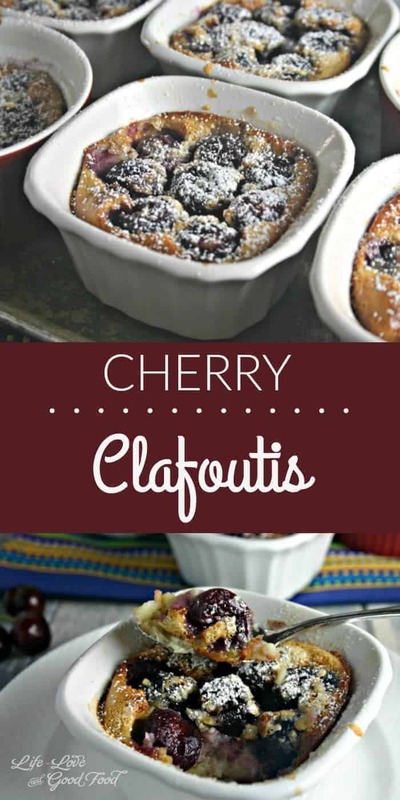 Practice saying it, “Cherry Clafoutis,” (pronounced klah-foo-tees). Makes you feel elegant, right? Developed in France, this dessert is traditionally made with black cherries. Today’s recipe (inspired by David Leibovitz and his beautiful food photography) is made with sweet cherries (in season now) covered with a rich flan-like custard and baked in individual buttered ramekins. I’m definitely no Julia Child, but I did feel a little French preparing this delicious dessert! The recipe starts with cherries, of course. 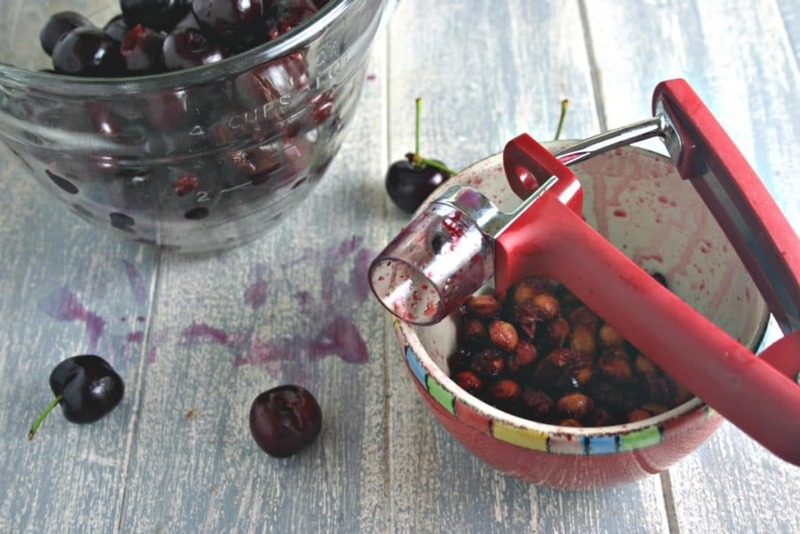 The hardest part about this recipe is pitting the cherries and even that is quick and easy with my OXO cherry pitter, one of my favorite kitchen gadgets! You’ll need to stem and pit a pound of sweet cherries. Watch that you don’t eat too many while you’re prepping. Hmm…I might be a little guilty of that myself! Liberally butter individual ramekins and place a single layer of cherries on the bottom and the most time consuming prep work is done. 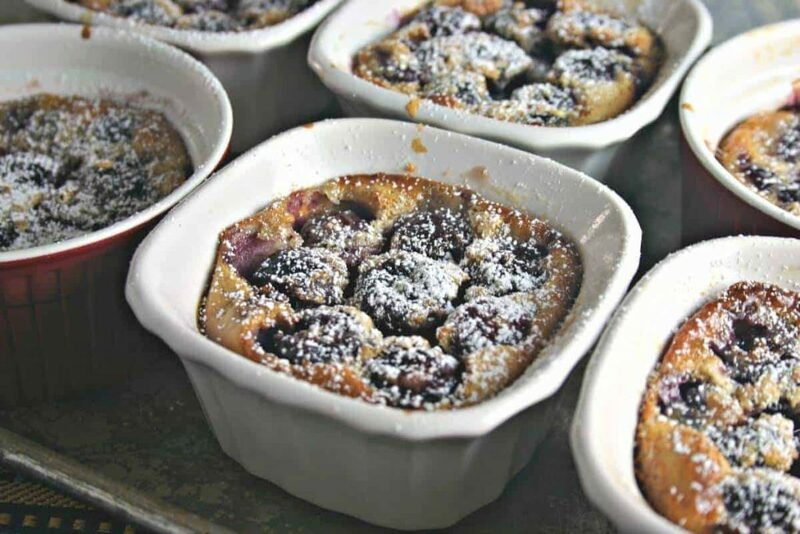 If you prefer to bake the clafoutis in a single baking dish, that will also work. Just be sure to increase your baking time 10 minutes or so. Next, prepare the batter by dumping the remaining ingredients — eggs, flour, sugar, milk, vanilla and almond extracts — into a blender and processing until smooth. Nothing fancy about that! I love that except for the fresh cherries this recipe is prepared with all staple ingredients. Pour the batter evenly among the ramekins and then sprinkle the tops with a little sugar. Pop them into the oven and bake until the custard is set. I sprinkled the clafoutis with a little powdered sugar while they were still warm. These desserts can be served warm, at room temperature, or chilled, and can be made a day ahead and refrigerated. Bon Appétit! Cherry Clafoutis. 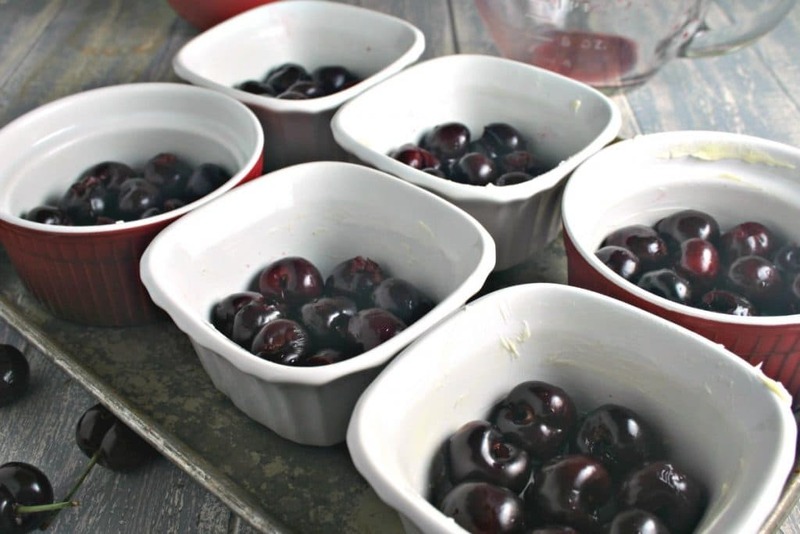 Sweet cherries covered with a rich flan-like custard and baked in individual buttered ramekins. Preheat oven to 375 degrees. Prepare six 8-oz. ramekins by liberally coating the inside with softened butter. Stem and pit the cherries, then place them in a single layer in each ramekin. Combine remaining ingredients, except for the extra 3 tablespoons sugar, in a blender until smooth. 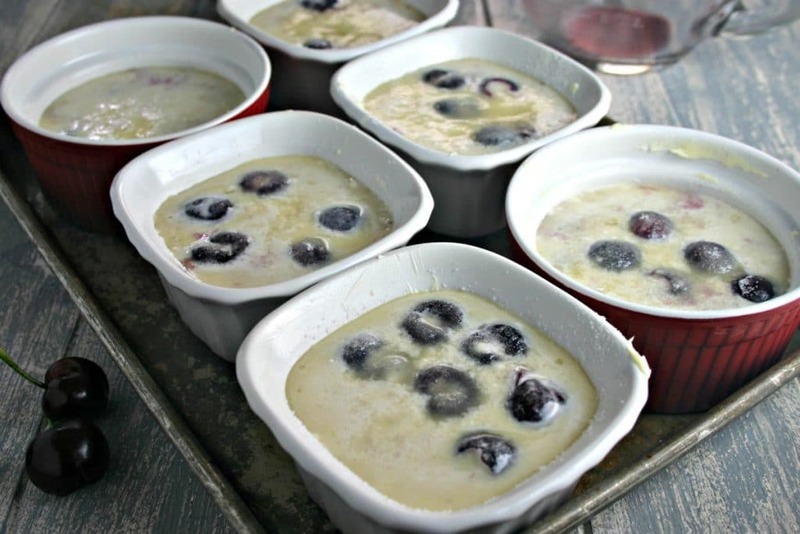 Divide the batter evenly between the ramekins, then sprinkle each with 1/2 tablespoon sugar. Bake until the custard is set, about 35 minutes. Ohhhhh lovely looking cherry goodness! Thank you for sharing! 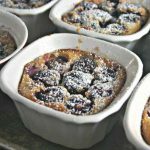 I love clafoutis and never realized how easy they are! I’m totally making this soon – yum! I love when Cherry Season is in season! I’ve been practicing my pronunciation, so I’m ready to enjoy this lovely dessert 😉 Love those cherries, for sure! This looks so good and I love anything with cherries! Yum! What a perfect dish to celebrate that cherry season has finally arrived! Is it advisable to use frozen cherries, let them thaw before using? I think fresh will work best, but if using frozen, definitely let them thaw and drain off any moisture before using. Let me know how that works if you do try it…thanks!